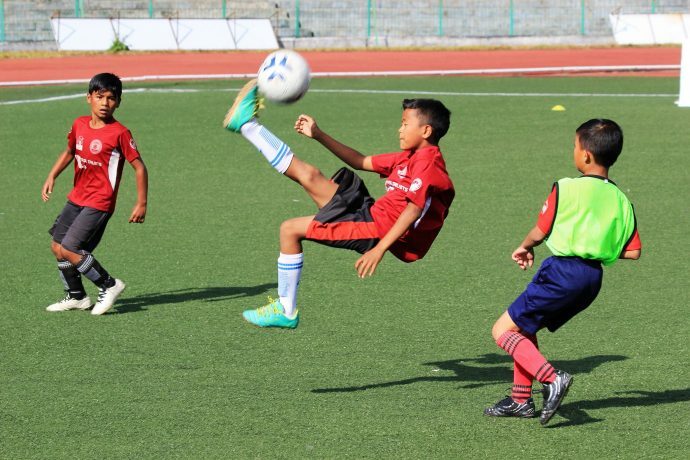 The Meghalaya Baby League, the first of its kind in India, garnered plenty of headlines across the country during its inaugural season in 2018, but grassroots football development has, behind the scenes, been making impressive progress in Meghalaya. The biggest grassroots football tournament in the state is the U-12 Chief Minister Youth Development Scheme Football Tournament, which has seen thousands of boys and girls take part over the years. The tournament begins at the block level, with the winning teams from each block progressing to the district-level tournament and finally the state-level tournament. Clubs, schools and other stakeholders are able to field teams. Run by the Government of Meghalaya’s Directorate of Sports and Youth Affairs, this tournament has been the foundation to spot budding talent in the state and the best players have gone on to represent Meghalaya in the Subroto Cup and Sub-Junior National Football Championship. This competition is held in the first half of the calendar year, while in the second half, the Shillong Sports Association conducts its own U-12 football tournament for boys in the Greater Shillong area, which is the most populated region of Meghalaya. Players to have come out of this tournament include Samuel Lyngdoh Kynshi, Phrangki Buam and Kynsailang Khongsit, who now play for Shillong Lajong, the first club from the North East to feature in the I-League. Grassroots development has also seen a further boost with the launch of the Government of Meghalaya’s Mission Football in the summer of 2017. Under this programme more than 70 grassroots centres have been established across the state in order to develop football, with children meeting up on weekends. An Advance Centre was also launched in November 2018 to continue the work of the grassroots centres after children cross the age of 12. With all this already in place, the Meghalaya Football Association (MFA) was keen, however, on the concept of the Baby League when it was put forward by the All India Football Federation. This was because the Chief Minister Youth Development Scheme and Shillong Sports Association tournaments were of short duration. What was lacking was a tournament that gave children exposure to competitive football over several months and this is where the Meghalaya Baby League fit in. Over 1,000 boys and girls registered for the inaugural season, which saw 12 teams play more than 1,300 matches on weekends over seven months. The 2018 edition drew in teams from only East Khasi Hills district, but was still able to be non-Shillong centric, with four teams – Mawlatbah SC Hawks, Wahlakhiat Bulls, ENE Falcons and Nongtrai Cheetahs – based in rural areas. camaraderie, fair play, respect for one another as well as self-respect, which is all part of a healthy lifestyle and a healthy society. We have seen tremendous support from parents and friends and family in the inaugural season and we are firm in our desire to get the Baby League into other parts of the state from this year onwards,” Meghalaya Football Association CEO Arki Nongrum said. Looking ahead, a further expansion of grassroots programmes is on the cards. The MFA plans to take the Meghalaya Baby League across the state with the help of Tata Trusts and the AIFF. The MFA also plans to introduce an U-15 tournament as a stepping stone for children who graduate out of the Baby League. The state association also intends to expand its women’s programme from the ground up. That means encouraging girls to take up football from a young age and starting football coaching programs and tournaments for girls, apart from their ongoing participation in the Baby League. It has been tremendously encouraging to see the support of all stakeholders in the development of football at the grassroots. With associations, clubs, schools, the government and parents on board, Meghalaya is on course to take grassroots football to all corners of the state and bringing up children in the spirit of the beautiful game.